I often wondered why Fisher Price named their dolls ‘Little Mommy’. Then I happened to visit a Naidu Hall showroom in Tamil Nadu where they have a particular paavadai-satai set called ‘Chintti Thalli’ (which also means little mommy in Telugu!). Both left me thinking why ‘little mommy’ for little girls! And then I figured out the answer last week! Since last week, K80 has been acting all motherly with her teddy bears and the one baby doll she has. Each time I give her a plate to eat, she runs quickly, picks up either her teddy or her doll, puts them on her lap and starts feeding them (thankfully she remembers to feed herself occasionally in the process!). 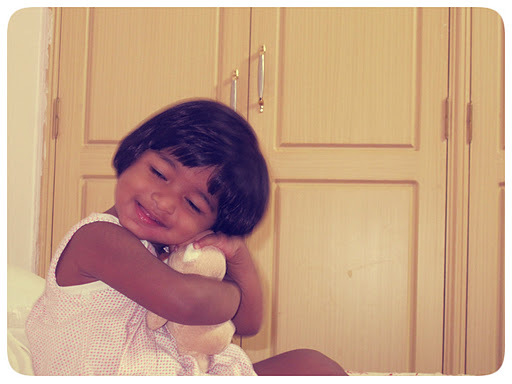 Then I see her keeping my mobile in teddy’s ears, repeating ‘heylooooo.. heylooooooo..!’ asking the teddy to speak! 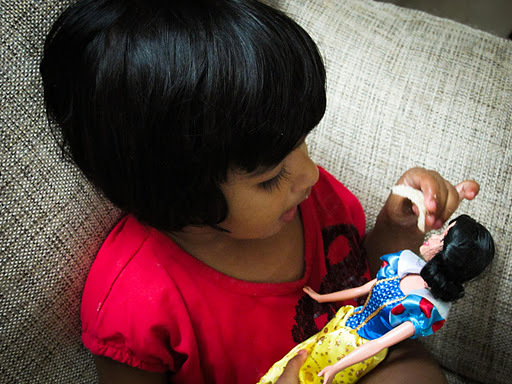 Today she received her first, proper doll – a Disney princess! Thanks to her aunts who have sent it! This post is specially for you! What amazes me the most is seeing how at this tender age their DNAs are programmed with motherly instincts preparing them for what awaits years later! Awaiting more adventures with you my little mommy – dressing up, shopping, baking and more!